The annual Officer Basic Training course which aims to equip teachers with the knowledge of being as an officer in a uniform group, was conducted from 03 November 2014 to 14 November and comprises of Non-Residential Course and Adventure Training Camp. Upon completion of this course, a certificate of appointment will be issued to the participants. 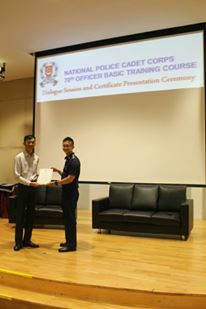 Jurongville Secondary School NPCC unit will like to congratulate our newly appointed P/INSP (NPCC) Mr Justin Ho on the completion of this course. We would also like to take this opportunity to welcome him into the JVSNPCC family. Besides the certificate of appointment, this year, the first Teacher Officer Course Combined Graduation Ceremony 2014 was held in Pasir Laba Camp. This ceremony which unifies different uniform groups (namely NCC,NPCC,NCDCC) newly appointed teacher officer in a single graduation ceremony was graced by the Minister of Education, Mr Heng Swee Kiat. Highlights of the different journey experienced by the different uniform groups newbie teachers can be found in this short video. http://www.youtube.com/watch?v=t5t9Z2anvxk Once again, Jurongville Secondary School NPCC unit will like to welcome Mr Justin Ho to the big JVSNPCC family!